Defence Forces Pvt Chloe Carroll from Dublin, Able Seaman Leia Wall from Meath and Air corps Sgt Anne Kelly from Kildare attending the commemoration for women in the 1916 Rising , as part of 1916 State commemorations. THE DEFENCE FORCES believes that gender diversity is not just a moral imperative, it’s an operational one that helps it do its job better. However, Minister of State at the Department of Defence Deputy Paul Kehoe said in December that he would be “the first to state we have faced challenges in fulfilling our gender targets”. Because of this, he has asked civil and military management to look at the recent recruitment campaigns and establish the number of female applicants – and how many may have fallen off by the time of interview or around the time of the medical and fitness test. There are currently 9,219 personnel in the Defence Forces, but the levels of departures have exceeded intakes in recent years, which has led to challenges in meeting the target of 9,500 personnel. When asked about the issue of gender and recruitment, the Defence Forces said that it is committed to gender equality and employs a gender perspective in all its policies and regulations coordinated by the Defence Forces Gender, Diversity & Inclusion Office. Gender diversity is not just a moral or policy imperative; it is also an operational imperative as diversity within a large organisation such as ours is a hedge against the complexity of the modern operational environment. It said that the Government is committed to a policy of equal opportunity for men and women throughout the Defence Forces and to the full participation by women in all aspects of Defence Forces activities. This is underlined by a commitment in the Programme for Government to increase the level of female participation in the Defence Forces. “All positions within the Defence Forces are open to males and females on merit and equality of opportunity,” said the statement. It said that the Defence Forces encourages deployment of mixed gender units “in order to increase operational capability, increase situational awareness, force credibility and assist increase the security in the environments we operate”. It has also developed a diversity and inclusion strategy and associated action plan, and pointed out that the Irish Defence forces, Danish and Finnish Armed Forces are the only militaries in the world with action plans on UNSCR 1325 specifically prepared by their forces. This is a UN resolution on women, peace and security, which was adopted in 2000 and “reaffirms the important role of women in the prevention and resolution of conflicts, peace negotiations, peace-building, peacekeeping, humanitarian response and in post-conflict reconstruction and stresses the importance of their equal participation and full involvement in all efforts for the maintenance and promotion of peace and security”. Some of the initiatives in the Defence Forces action plan included a female-focused recruitment campaign, targeting the female recruitment demographic through social media, and female outreach programmes to schools and sporting clubs to promote a career in the Defence Forces. It also included “a strong female perspective” in Defence Forces PR activity, and had an internal communication campaign on the importance of gender diversity. There are gender advisors in each of the Defence Forces’ headquarters, and gender focal points when deployed overseas. It also has family-friendly policies such as shortened or shared overseas deployments, semesterisation of professional military courses to become more ‘family friendly’. There is also a Defence Forces Women’s network. This winter, Fine Gael Deputy Lisa Chambers asked Taoiseach Leo Varadkar – who is also Minister for Defence – about the gender breakdown of the Defence Forces. Deputy Kehoe said in his response that there is “significant ongoing recruitment at both enlisted and officer level”. It’s anticipated that up to 800 new personnel will have been conducted into the permanent Defence Force during 2017. He said that a range of recruitment methods are being employed, including direct entry competitions for specialist positions “and the scope to further expand direct entry is being considered”, said Kehoe. Email “Defence Forces 'facing challenges' in fulfilling its gender targets”. 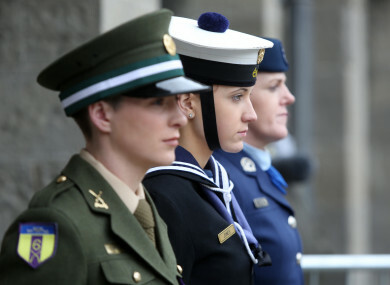 Feedback on “Defence Forces 'facing challenges' in fulfilling its gender targets”.